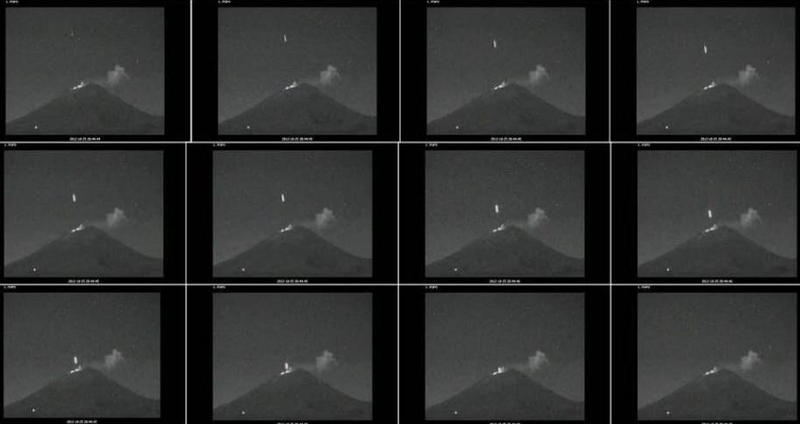 At 20:44 hours on 25 October, CENAPRED's cameras, located at the Altzomoni Station for continuous virtual monitoring of the Popocatepetl Volcano recorded the manifestation and transit of a luminous signal, intensely bright, in the upper left hand quadrant of the image, moving at great speed, increasing its brightness, and apparently introducing itself into the volcano's crater (Figure 1a). The presence of this signal in the image has an approximate duration of 3 seconds. The CENAPRED's camera at Altzomoni is located 11 kilometers from the Popocatepetl Volcano's crater, and a few meters away from where the Televisa corporation has installed another camera on which similar images were recorded and rebroadcast on the "Noticiero con Joaquin Lopez Doriga" program on the night of Friday the 25th (Figure 1b). It should be noted that differences in shape, length, shadows and brightness between the images taken by the CENAPRED camera and the Televisa camera are related with technical aspects particular to each item of equipment, mainly their resolution. Moreover, the framing in the case of the CENAPRED images is much more open, while the Televisa camera is much more light sensitive. Figure 1. a) Image of the CENAPRED camera at 20:44:45 on 25 October and b), Image of the Televisa camera on the same day. During the luminous signal's descent, none of the volcano's stations registered relevant seismic signals. The seismic record shows no modification or signal that could be associated with the possible impact of an object within the crater or its vicinity. The Popocatepetl Volcano's behavior in the days surrounding the event remained within normal parameters. The seismic monitoring system recorded between 35 and 70 emanations per day. These emanations were of low-to-moderate intensity with emissions of water vapor, gas, and small amounts of ash. 45 emanations, specifically, were recorded on 25 October, mostly of moderate intensity. The most relevant emanation immediately prior to the sighting of the luminous object described was recorded at 20:42 hours (Figure 2). The volcano issued a pulse of water vapor and gas that headed in a west-southwest direction and increased the incandescence over the crater slightly, which was observed in a constant manner throughout the entire night (Figure 2b). Figure 2. a) Emission of water vapor and gas related to a moderate intensity emanation recorded on 25 October at 20:42 hours. b) Light incandescence visible most of the night on Thursday the 25th. The framing differences between both cameras is significant, since the wider visual field of the CENAPRED camera enables the viewer to see the apparition of the luminous signal and the increase in its brightness, while in the images shown by Televisa, the object has already achieved its maximum glow when it enters the frame. It must also be considered that both cameras are night vision type, that is to say, they are particularly sensitive in low-light conditions, and the pixels are easily saturated by a bright light, exaggerating its size and keeping it "lit" for a longer period of time, which explains the rectangular shape acquired by the object when it achieves its maximum glow. A detailed observation of the images allows us to state that the object did not fall within the crater. Rather, it traveled along a much more distant plane. Its appearance in the upper part of the atmosphere, its trajectory and the increase in its brightness seem to indicate that it was a particularly bright meteorite, also known as a bolide. 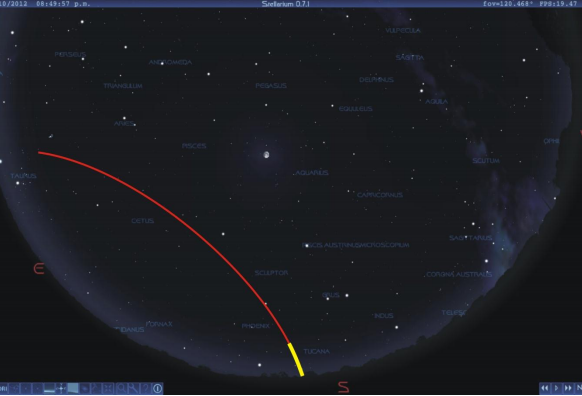 At this time of the year we find two active "meteor showers". First the Orionids, active from 2 October to 7 November, reaching their peak of up to 25 meteorites per hour on the night on 20 October, and secondly the Taurids, active from 1 October to 25 November, reaching their maximum of up to 5 meteorites per hour on 5 November. They are given these names as the meteorites follow trajectories that appear to originate in the regions of the constellations of Orion and Taurus, respectively. While the Orionids tend to be meteorites that enter the Earth's atmosphere at high speed and are small in size (grains of sand), producing long trails that last less than a second. The Taurids are made up of somewhat larger fragments (gravel) and travel more slowly, frequently generating bolides, that is to say, very bright meteorites (may exceed the brightness of Venus) that travel for several seconds before consuming themselves. Figure 3. 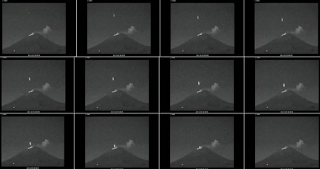 Sequence of images taken with the CENAPRED camera every 25 seconds, showing the bolide from its appearance until it vanishes behind the volcano. Considering that the crater is 800 meters wide, the bolide's luminous trail never exceeds an apparent 200 meter in length. apparently. Its trajectory, slightly tilted from left to right, when projected upward and above the camera, would come from the Taurus Constellation, which at that moment was in the horizon to the northeast of the camera (behind and to the left). Figure 4. 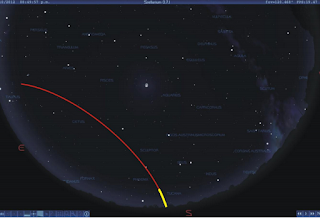 Image generated by the Stellarium 0.7.1 Program available at www.stellarium.org, showing a map of the sky over Altzomoni on 25 October at 20:44, showing in yellow the trajectory followed by the bolide, and the extension of its trajectory in red toward Taurus near the Pleiades. The trajectory is curved due to the curvature of the celestial vault. 1. In accordance with the analysis performed by specialists from this Center, this event bears no relation whatsoever with the Popocatepetl Volcanos activity. At the time of apparent contact between the luminous object and the crater in subsequent moments, no changes in seismic signals were recorded. This leads us to state that while visually, the luminous phenomenon appears to enter the crater, it very likely is traveling along a far more distant plane behind the volcano. This statement is bolstered by the fact that none of the other four cameras of the visual monitoring network surrounding Popocatepetl recorded the object in question from their respective angles of vision. 2. The luminous signal in the atmosphere, recorded by CENAPRED's camera in Altzomoni as well as by Televisa's camera at the same location, could be associated with an astronomical event, specifically a bolide from the Taurid meteor shower, given its characteristics and its trajectory. That is to say, it was probably a meteorite that entered the Earth's atmosphere, leaving a luminous wake produced by friction. 3. We cannot dismiss, however, the possibility that the object was a fragment of an artificial satellite that left a luminous wake similar to that of a meteorite as it entered the atmosphere. 4. It should be noted that for the two hypotheses mentioned above, an exhaustive validation and analysis by institutions and experts in astronomy and space science is necessary. Done by: Office of the Deputy Director of Geological Hazards of the CENAPRED Research Office, 30 October 2012. Another UFO in Gualcamayo, Argentina? A CLOSE ENCOUNTER OR A VISITATION?